It really can be the smallest of kind acts that can make your heart run over. At the end of last year, stuck to one of our school walls, I came across the small post-it note pictured above. 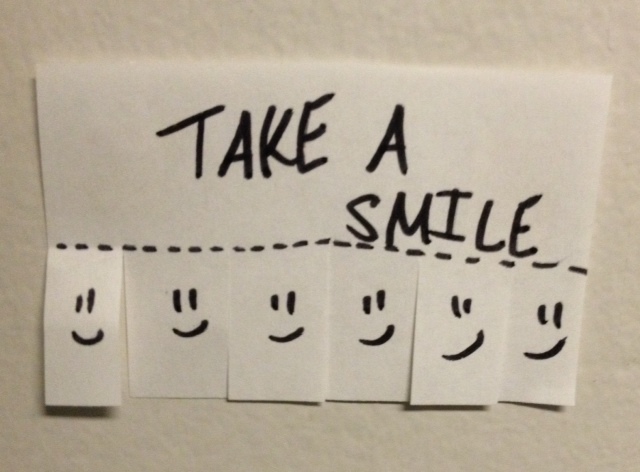 It was a simple concept, offering up a smile to anyone needing one. I have no idea how long it had been there, or where it had come from, but seeing all of these little happy faces grinning back at me warmed my heart and made me smile. Determined to find out who was responsible for this random act of kindness (RAK), I sent a picture out to staff. However, since sometimes the best part of a random act of kindness is in the mystery, no one took ownership. Wanting to share the smile, I sent it to friends and colleagues. From this tiny post-it note, the concept spread. 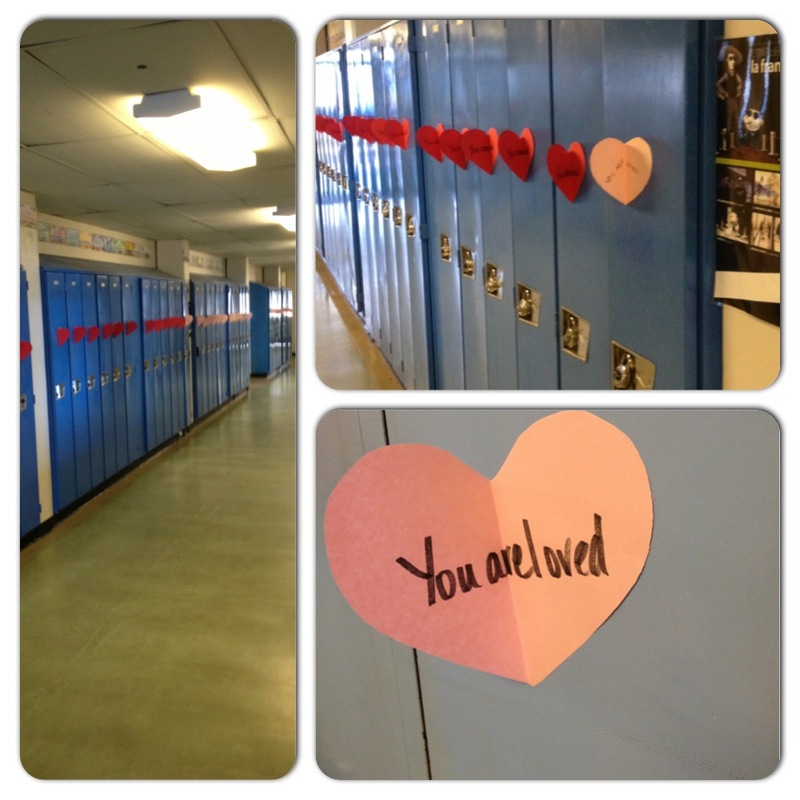 Some staff planned their own RAK and some colleagues followed suit with carefully posted notes in their own schools. The greatest part of a RAK is that it is hard to know how far the ripples of kindness will extend. Over the years, I have been on the receiving end of many wonderful acts of kindness. Last year, one of the secondary schools in my district planned a mass RAK for every student in my school with the purpose of simply spreading a message of love and kindness. With the effort of many, it happened over the weekend. When students and staff returned Monday morning to find the lockers, doors, and walls pasted with pink and red hearts it created a sense of happiness and joy that was palpable. The building felt alive and there was a lightness in the school that is hard to put into words. Over the years, I have also had the opportunity to see the impact participating in a kind act can have on students and adults alike. The research behind the benefits of participating in acts of kindness is abundant. Shawn Achor, author of The Happiness Advantage, argues that one of the key factors to happiness is participating in acts of kindness. The benefits of performing acts of kindness are undeniable. Performing kind acts cultivates shared happiness, builds relationships, and connects us to the larger world. In a recent study out of the University of British Columbia entitled Kindness Counts, a group of researchers studying 19 classrooms of students ages 9 to 11 found that students who performed three acts of kindness were happier and also experienced greater levels of peer acceptance at the end of the study. Performing acts of kindness also fosters a sense of empathy and compassion that is at the root of establishing basic emotional intelligence. The more a child practices acts of kindness, the more likely they are to recognize and act on situations when others are in need. In addition, they are also better able to recognize the impact of their actions on those around them. Looking at the brain science, practicing kindness also strengthens the neural pathways necessary for detecting emotions and releases dopamine, that happy chemical in our body. Performing acts of kindness in your classroom can be as simple as a post-it note on a locker or require a bit more organization like creating a “Thank You Tree” for your local library or some little care packages for your local elementary school; a couple of kind acts that students in my school participated in this year. There is also an abundance of great lessons, activities, and picture books that introduce the concept of kindness and get ideas flowing. Read The Kindness Quilt by Nancy Wallace and have students brainstorm what kindness looks like, feels like, and sounds like. Create “Kindness is…” posters and display them around the school. Read The Important Book and have students create a class book entitled “The important thing about kindness.” By using the format of the book, students focus on what kindness is and what kindness is not. Read Ordinary Mary’s Extraordinary Deed and create a flow chart that outlines the chain of events that resulted from one kind deed. Read Ms. Rumphius and have students brainstorm a list of kind acts they could perform for others, for themselves, and for the world. Have students select and perform one of their kind acts and report back. Read Have You Filled a Bucket Today. There are so many activities you can do with this book. My favorite included having students make their own paper buckets. 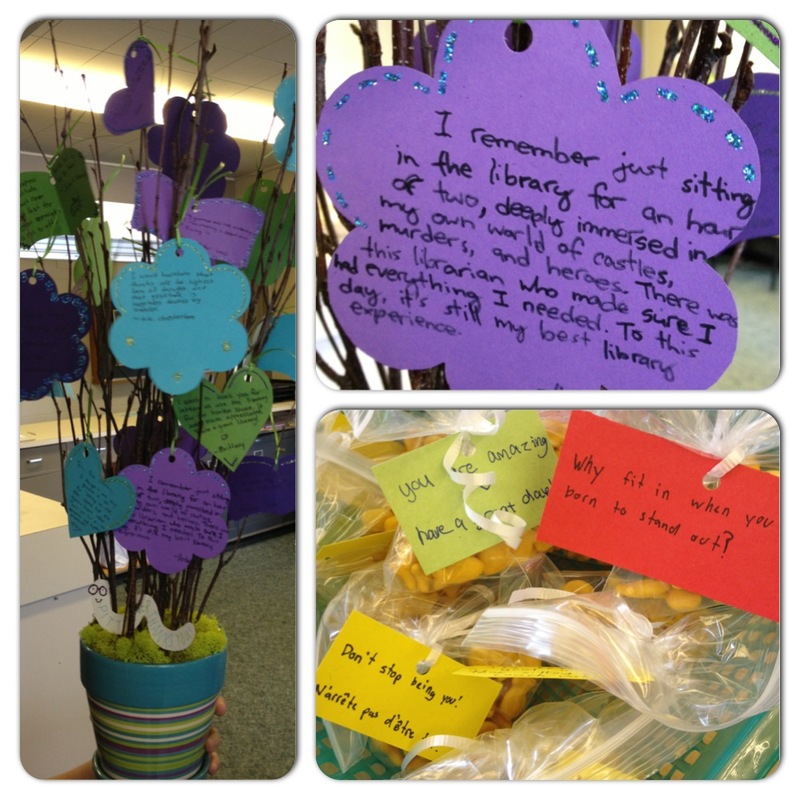 They then wrote down a simple gratitude for each person in the class and placed it in that student’s bucket. This book lends itself to great conversations about what it means to both fill and dip into the metaphorical happiness buckets of others through our actions and our words. Write and deliver thank you letters. Have students research and report out on someone whose kindness made the world a better place. 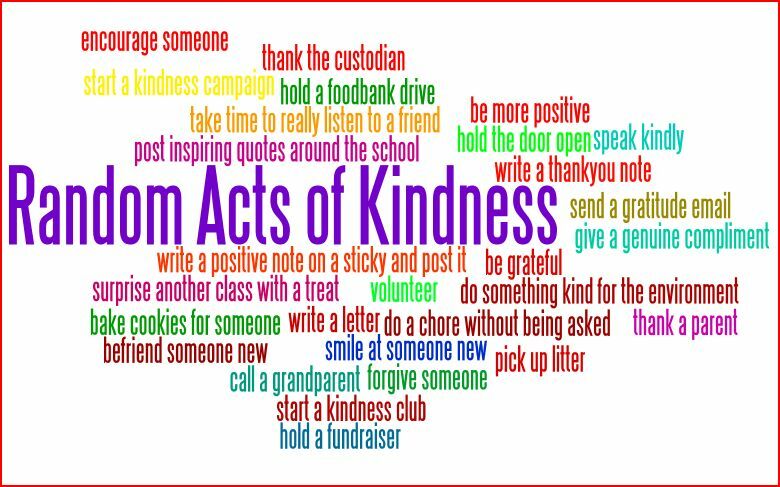 Have students use their list of possible kind acts to create a kindness wordle like the one below (www.wordle.net). Post their wordles around the school to inspire others. In my job, each day I am given the opportunity to work with amazing kids. For a few short years, I have the opportunity to watch their successes and their struggles, to see them persevere against the challenges of middle school, and to see them strive to figure out who they are and where they fit in. As I watched our recent group of Grade 8 students walk across the stage at this year’s middle school leaving ceremony, I couldn’t help but wonder where life’s path would take them. I have little worries about some. Even at a young age, they seem to have a resiliency and sense of purpose that assures me they will find their way. For others, I know the road will be harder, there will be more bumps and obstacles in their way, and I am left hoping that they have the grit and determination to persevere and come out the other side stronger and more self-assured. What it is that makes some children more resilient than others? What is it that causes some to thrive and some to lose their way in life? And what can be done to foster the resiliency needed to succeed? Stress, Adversity, and the Teenage Brain: No surprise that studies have shown that early adversity puts stress on the brain making it harder to concentrate, sit still, follow directions and bounce back. However, while the brain and body are more susceptible to the impact of stress in early childhood, in adolescence the damage stress leaves can cause more serious and long lasting problems. When something is out of balance in the adolescent brain it is more prone to making poor or impulsive decisions. This stress or trauma comes out in two ways. It is either turned inward and manifests into fear, anxiety, sadness, insecurity, and self-destructive actions or it is turned outwards and manifests itself in behaviour. As educators, it is easy to pick out those who manifest stress in a way that is impossible not to notice. Where it gets tricky is identifying those students who survive by turning inwards. The Role of Parents: Dozens of studies have shown that children with a secure attachment with a parent are often more socially competent and better able to manoeuvre their way through the teen years. With that said, studies have also shown that you don’t need to be a super parent. Instead, just being helpful and attentive to your child’s needs and emotions can make a dramatic difference in a child’s life. For students lacking this secure attachment, schools play an even bigger role in trying to fill these shoes. The Brain is Malleable: Tough argues that the brain is malleable which means teens have the capacity to rethink or remake their lives in a way that young children don’t. 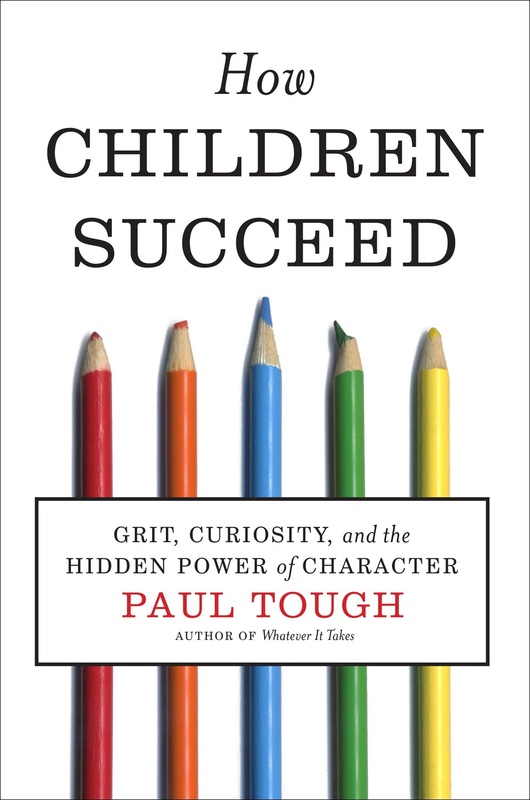 Tough argues that to be a good teacher, you have to fundamentally believe that both intelligence and character are malleable and that children can change the way they think and act. There can be enormous growth when a child believes this too and Tough’s book is riddled with success stories that are both compelling and heart-warming. The Importance of Failure: As important as teaching the character traits is teaching students that failure is a crucial part of the learning process. While it is in our biological makeup to want to protect our children, what they need is some struggle, some challenge, and the opportunity to overcome even if just to prove to themselves that they can do it. In order to succeed, sometimes you first have to learn how to fail. The Importance of Mental Contrasting: Middle school is the key age to transform pessimism into optimism but it is not enough to just teach students how to be optimistic. In contrast, students need to actively learn how to concentrate on a positive outcome while focusing on the obstacles they will need to overcome. By doing so, this creates a strong link between the future and an action plan needed to overcome the challenges most likely faced along the way. Student Management: As educators, Tough argues that it is crucial that we look at how we approach discipline. In a school run on a compliance based system, a student’s own ability to make decisions is often suppressed. Effectively working with students requires more conversations, bigger questions, and an emphasis on really hearing and respecting student voice. Students will make mistakes and they will fail, but they need to look their choices in the eye, see where they messed up, and believe they can do better next time. As educators, our greatest hope for all our students is that each will develop the resiliency, the grit, and the determination to overcome adversity and to find their purpose and passion in life. The reality is we know that some have a long and hard road ahead of them. With that said, I have the opportunity to see resiliency thrive on a daily basis. So many of our students, no matter where you teach, have been dealt a tough hand, yet something in them drives them forward and pushes them in a positive direction. Perhaps it is something innate inside them or perhaps, as Tough says, it is the people in their lives who have helped them up the ladder.